Mike Hoffman scored the go-ahead goal, and rookie goaltender Sam Montembeault won his third straight start to lead the visiting Florida Panthers to a 4-2 win over the San Jose Sharks on Thursday. Jamie McGinn, Dryden Hunt and Frank Vatrano also scored for the Panthers, who won their third straight overall and third consecutively in San Jose. Montembeault, 22, made 26 saves in his first road start, and he improved to 3-0-1. Melker Karlsson and Kevin Labanc tallied for the Sharks, and goalie Martin Jones stopped 23 shots. San Jose had its six-game winning streak snapped and fell to 15-4-1 in its past 20 contests. The Sharks played without Evander Kane, who has been out since Feb. 26 due to injury. The winger issued a statement Thursday, announcing the passing of his daughter, Eva, at 26 weeks of his wife's pregnancy. San Jose, the NHL's second-highest scoring club at 3.63 goals per game before Thursday, grabbed a 2-1 lead in a busy first period. Karlsson fought off a defensive challenge and fired in a bad-angle goal from the right circle at 7:22, netting his 12th goal and 100th career point. McGinn tied it at 11:45 when he jammed home his fourth goal in front of Jones after San Jose's Timo Meier deflected Aaron Ekblad's long shot. 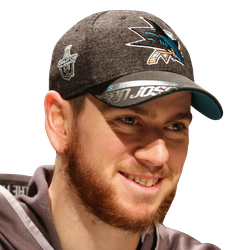 San Jose defenseman Justin Braun faked a shot from the blue line and whipped a cross-ice pass to Labanc, who one-timed his 13th goal at 14:36 for the Sharks' second advantage. Hunt opened the second period by wristing in his second career goal and second in as many games from the slot at 1:25 to tie the game again. Hoffman blistered a power-play goal just 23 seconds into Florida's fifth man advantage for a 3-2 Panthers lead after the Sharks had too many men on the ice. Vatrano made it 4-2 when he chipped in his 22nd goal on a short pass from Hoffman at 8:17 of the third period to round out the scoring.